In a milestone event, Tata Hitachi’s Kharagpur plant announced the roll out of its 1 0,000 th machine today. The machine, Z AXIS 470H, was handed over to Mr. V. Prabhakar Reddy of VPR Mining Infrastructure Private Limited – a leader and trend setter in the Indian mining industry, with many global ongoing projects and a big patron of Tata Hitachi. 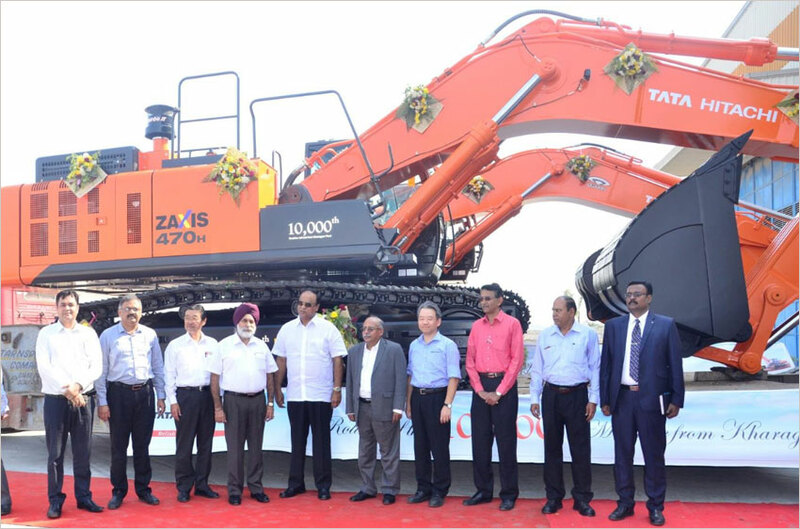 The day also marked the rollout of the 10,001 st machine – the ZAXIS370GI excavator – which was handed over to Mr. Nilamani Panda of Balasore Alloys Limited. Taking delivery of the machine, Mr. V Prabhakar Reddy, said “I am happy to be here this afternoon to receive the 10,000 th machine. I would like to compliment Tata Hitachi for supporting us with timely service and availability of spare parts. Our relationship has come a long way and I am sure that with its traditional grit and resilience Tata Hitachi will scale new heights wit h superior products to achieve total customer satisfaction “. Mr S. Nakajima , Director representing Hitachi Construction Machinery Co Ltd, Tokyo , said “With the economic growth and expansion of the market, our Kharagpur plant will play an integral role in meeting domestic demand and address export requirement as well”. The Tata Hitachi Kharagpur plant is a stellar example of world class manufacturing, state – of – the – art – technology and has been conferred with the TPM excellence award by the Japan Institute o f Plant Maintenance. This 250 acre plant is counted amongst the biggest construction m achinery manufacturing facilit ies w hich also has a unique mix of batch and mass production. The plant currently produces hydraulic excavators from 5 T to 40 T, wheel loade rs, motor graders, and dump trucks. The Kharagpur plant has been spearheading skill development programs through its Operator Training School and has been addressing several social and community initiatives in and a round Kharagpur city.